On May 12, 2011, at the age of 84, Abraham Szyller publicly addressed an experience he had refused to speak about for almost 70 years. Before a rapt audience at Stennis Space Center, Abraham recounted his terrifying escape from the Gestapo as a 15-year-old boy in Nazi-occupied France. His long refusal to share these memories stemmed from his determination to focus on the positive. Concerned that the truth could be lost, however, Abraham recognized that silence no longer remained an option. And so, he told his story. The remarkable success that Abraham achieved in his new life in Louisiana appears to have validated his decision to put the past behind him. Remember those great “Put This Man to Work” and “Fight the Uglies” ad campaigns for LAS Enterprises? 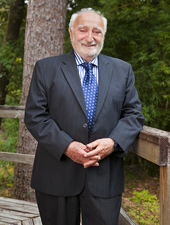 Abraham founded the company in 1957. After selling it in 1989, he returned to school and, at age 64, earned a Ph.D. in psychotherapy. Continually moving forward, Abraham then developed a strategy to prevent relapses among patients struggling with alcohol and drug addiction. He founded New Horizons Institute to administer his innovative program, which teaches meditation and relaxation techniques to overcome stress. As we age, our determination to make sense of everything is tempered by an enhanced appreciation for the many things in life we cannot explain. It is often said that time heals all wounds, but Abraham knows that some wounds never heal. Time gives us an opportunity, however, to accept those wounds and embrace them as an essential part of our identity. Life experience gave Abraham the wisdom and confidence to transform the evil and horror he faced in youth into a positive force of knowledge and understanding. By telling his story, he has reminded us of the power and resilience we all possess to take control of our lives and make this world a better place. Abraham Szyller … Peoples Health Champion.